Everyone likes a good ghost story this time of year, but not many of us have actually lived one. Then there is Randy Myers, who not only claims to regularly see spirits but believes he has recorded and photographed them. 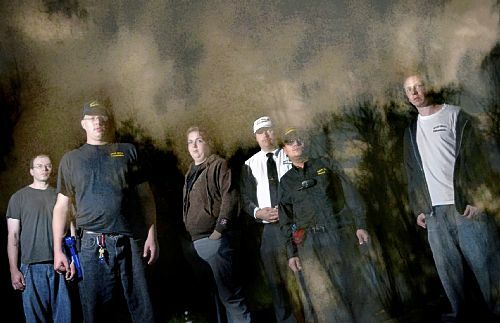 As often as once a week, the McKeesport native and other members of East Hills Paranormal are on the hunt for things that go bump in the night. Sometimes, the Pitcairn-based group heads to sites made famous by urban legend, such as Dead Man’s Hollow in Elizabeth Township, the scene of at least four deaths in the past 135 years, or the “lost” town of Livermore, Westmoreland County, which was evacuated, razed and flooded in the 1950s to make way for a dam on the Conemaugh River. All that remains, other than its spooky cemetery high on a hill, are broken foundations and stories of a ghost house that vanishes and reappears. “Whatever piques our interest that day,” Mr. Myers says. After a recent ghost-hunting trip to Quaker Cemetery in Perryopolis, while members in matching black baseball caps munched burgers at a Uniontown McDonald’s, they learned that an abandoned house just beyond the restaurant’s parking lot was rumored to be a hotbed of supernatural activity. Night-shift employees had heard unexplained voices on the drive-through intercom, and when a medium visited, she reported seven evil spirits, says Josh Shelton, who has been with the group since 2009 and is the unofficial field organizer. Damaged by fire and left to rot in a jungle of knee-high weeds and poison ivy, the two-story clapboard Colonial certainly screams “haunted house,” especially at dusk, when the group convened in its side yard with a reporter and photographer. Besides evil spirits, the house is a rumored hideout for drunks, crack addicts and bums, says Mr. Shelton. That explains why, in addition to flashlights, batteries and walkie-talkies, Mr. Myers and fellow ghosthunter Fred Broerman came armed with paintball guns. “We want to make sure we enter safely,” says Mr. Broerman, a former security guard who has been seeing ghosts since he was a kid. The most commonly reported paranormal experiences are the sounds of voices and that eerie, unsettling feeling of being watched. So the group brings tape recorders and digital cameras that sometimes capture a ball of light known as an “orb,” shadowy figures and unexplained blurs. Among the questions thrown out in the darkness in hopes of a ghostly answer are: What’s your name? How old are you? How did you die? How can we help you? … When is the apocalypse? A hunt is not limited to what they can see or hear. Finding evidence of ghosts requires more specialized equipment, too, including night-vision goggles and heat guns to detect changes in temperature (it will suddenly get colder when a ghost is nearby). East Hills Paranormal also uses EMF meters, which measure fluctuations in electromagnetic fields. If the meters trip near plugs and fixtures, you know you’ve got a live one, technically speaking, especially if it happens in a house like this one, which hasn’t been connected to Allegheny Power for years. All of the gathered information will be taken home and carefully analyzed over the next week. After an anxious five minutes to determine that the Uniontown house is indeed empty, as least of other people, members with flashlights and strap-on headlamps head up the broken staircase one spongy, damp step at a time. The smell of mold, urine and musty plaster permeates the air, and there’s so much debris on the floor, the group has to tiptoe around the room. Then whosh! A bat flies out of the rafters, setting everyone atwitter. The group seems even more unnerved by an inverted pentagram scrawled on a bedroom wall, along with references to Anton LaVey, an occultist who founded the Church of Satan in 1966. “Obviously, someone worships the devil here,” says Mr. Broerman, noting that such activity can bring out demons (evil) rather than spirits (lost souls). For the next 45 minutes, they wander from room to room, taking pictures, hollering questions, feeling for cold spots and shining their lights into closets and corners. The last time Chad Opfer was in the house, he says he saw an apparition in a doorway — a full body with a “red glare.” He’s really, really hoping for a replay. “Can you make yourself appear again?” he calls out at one point. “Use my energy! “Just don’t make me sick,” he adds, noting how spirits sometimes can give you headaches or flu-like symptoms. They also sometimes follow you home, which is why Mr. Shelton always offers a cleansing prayer before the group leaves a property. Later, they play and replay the tapes to see if they’ve managed to catch any electronic voice phenomenon, or ghost voices that you can’t hear until you play back a recording, Mr. Myers says. They find no voices on the Uniontown tapes, but the group takes back to Pitcairn several photos of ghostly orbs, proof positive, they say, of life after death. Mr. Broerman realizes many people are skeptical about what they do. “They’re afraid to think there’s something out there,” he says. Is it just me, or is pumpkin taking over? 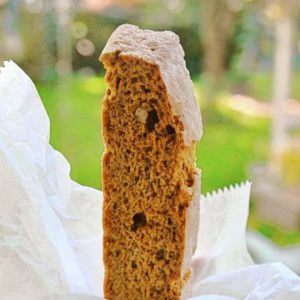 I was fine with seasonal pumpkin products such as pumpkin bread and pumpkin roll. But these days, you can find its distinctive autumnal flavor in just about everything from drinks to granola bars to pasta to ice cream, and the orange tide keeps rising. Even Pringles has joined in the Great American Pumpkin Party, including in its new lineup of limited-edition holiday season flavors a Pumpkin Pie Spice chip. Some of these pumpkin-powered supermarket foods and menu items make perfect sense, such as the seasonal pumpkin brews being poured through about Thanksgiving at local bars and restaurants. (See Bob Batz Jr.’s Beer Column.) I’m also developing a taste for the pumpkin-spiced coffees being brewed, also for a limited time, at chains such as Dunkin’ Donuts and Starbucks, especially when it’s paired with a decadent pumpkin loaf or a pumpkin and walnut biscotti from Enrico’s in the Strip District. A toasted pumpkin bagel stuffed with sweet and creamy pumpkin cream cheese (think pumpkin mousse) might sound like too much of a good thing, but trust me, it’s a customer favorite at Bruegger’s 300-plus U.S. locations for a reason — and not just for breakfast. Just thinking of it makes me hungry! But do we really need pumpkin-flavored dog treats, or nonfat Greek pumpkin yogurt, just two of the 20-plus “Pumpkin Season specialties” advertised in Trader Joe’s Fearless Flying brochure for October? Below, we offer a few more of the season’s best pumpkin-flavored offerings worth the calories, along with a couple that might have been better left in the pumpkin patch. Pancakes are good anytime of year, but they’re especially tasty when the batter includes pumpkin blended with cinnamon, nutmeg and ginger. DeLuca’s Diner in the Strip and Eggs N’at in Moon are just two of the many local diners and restaurants that put pumpkin hotcakes on the menu each fall, and they’re delicious, with or without maple syrup. DeLuca’s also has pumpkin pie crepes as well as a pumpkin hotcake sundae, which pairs pumpkin ice cream with a cream cheese glaze. If you’d rather wake up to a bagel, Brueggers, Einsteins and Panera Bread all feature pumpkin varieties this time of year. So does muffin-maker Thomas’, though its Pumpkin Spice bagels and bagel thins are a far cry from the chewy-on-the-outside, fluffy-on-the-inside taste you love in a fresh bagel hot out of the oven. It also has a Pumpkin Spice English Muffin. Pepperidge Farms, meanwhile, celebrates fall with its seasonal Pumpkin Spice Swirl bread. The “swirl” being pumpkin puree, this bread is best toasted, with plenty of butter. It’d also make an awesome base for French Toast. Not to be outdone at the breakfast table is Kelloggs, whose Frosted Pumpkin Pie Pop-Tart is sure to be a hit either with kids or adults whose taste buds never grew up. A better option is Pumpkin Spice Eggo waffles, part of its “Seasons” line of specialty waffles. A little butter and a drizzle of syrup, and you’re ready to go. Probably the signature seasonal pumpkin drink is Starbucks’ Pumpkin Spice Latte, a frothy coffee drink topped with sweetened whipped cream that has so many fans, local franchises occasionally run out of the special pumpkin syrup used to make it. That’s right, there’s no actual pumpkin in the product, though there are plenty of calories — 380 in a 16-ounce “grande.” Starbucks is to introduce Pumpkin Spice Latte ice cream in stores Nov. 1. Nipping at the coffee giant’s heel is Dunkin’ Donuts, which earlier this month launched Pumpkin Mocha and Pumpkin White Chocolate coffee and lattes, in addition to its Pumpkin Spice ground coffee. Brueggers has a pumpkin brew, too. For those who’d rather make and (artificially) flavor coffee at home, there’s Coffee-mate Pumpkin non-dairy creamer and International Delight’s Pumpkin Spice Coffee Creamer. Courting tea lovers is Bigelow Tea, whose collection of seasonal holiday tea bags includes Pumpkin Spice Tea. It’s blended using black tea and natural pumpkin flavors with cinnamon, licorice root, cloves and ginger. Slightly spicy and wonderfully aromatic, it’s perfect for sipping before bed. Plus, no calories. I wish I could say the same for another fan favorite: Dairy Queen’s Pumpkin Pie Blizzard (Blizzard of the Month for October). My daughters, who work there, say one out of every three customers orders one of these thick ice cream treats, which are made by blending vanilla soft serve, Libby’s Pumpkin Pie Mix and pie crust “chips.” Garnished with whipped cream and a sprinkle of nutmeg, it’s a button-popper in the making, with a whopping 570 calories in a small serving. For me, the better splurge was the Pumpkin Pie Margarita at Mad Mex, which has a taste reminiscent of hard apple cider. I was skeptical anyone could combine tequila with pumpkin with good results, but the frozen concoction was surprisingly delicious. Pumpkin also is making its way into staples such as salsa, pasta, snacks and spreads. My oldest son is a huge fan of Trader Joe’s pumpkin butter, which you can slather on cake or toast, stir into yogurt or oatmeal or spoon with peanut butter into a sandwich. Another of my running buddies loves the Spiced Pumpkin Salsa at Aldi, but I have to say, I’m suspect. At Triple B Farms in Monongahela, you can find Pumpkin Spice Lasagna Noodles and Fettucine; Pennsylvania Macaroni has pumpkin tortellini imported from Italy. At Crested Duck in Beechview, Kevin Costa has been sneaking the veggie into sausage. For sweeter tastes, Kraft devised Jet-Puffed Pumpkin Spice Mallows, perfect for a autumnal Rice Krispie Treat. 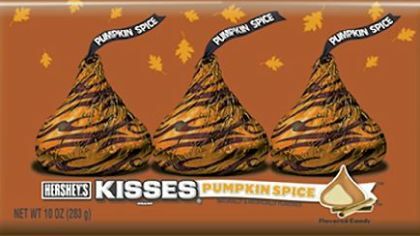 Hershey’s wraps the flavor in chocolate, in a Pumpkin Spice Kiss. Oh, I almost forgot: Pringles’ Pumpkin Pie Spice potato chips. The limited-edition flavor, which debuts next month at Wal-Mart, is not as weird as the White Chocolate Peppermint chip that’s arriving with it. Sweetly spicy, with a lick of fire and the light crunch of toasted seeds and caramelized sugar: I’d like tons of these with a hoppy beer. Or a spoonful on my pumpkin soup, bowl of chili or roasted squash. Just remember the seeds need an hour’s drying in a low oven before combining with flavorings. Preheat oven to 250 degrees. Line a baking sheet with parchment paper (I did not use). Cut pumpkin open from top to bottom and remove seeds with a long-handled spoon. You’ll be able to scrape about a cup of seeds from a medium (5 to 7 pound) pumpkin. (Fresh seeds are not to be confused with the already hulled pumpkin seeds, which are green, smaller and sold pre-packaged in stores.) In a bowl of water, separate seeds from the squash gunk and blot on a tea towel. On a baking sheet bake the seeds until completely dry, 45 minutes to an hour. They’ll darken to a crunchy ruddy gold. In a medium bowl combine 3 tablespoons sugar, salt, cumin, cinnamon, ginger and cayenne. Heat oil in a large nonstick skillet over high heat. Add seeds and remaining 2 tablespoons sugar. 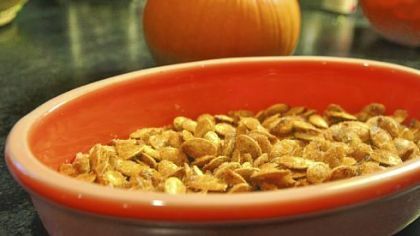 Cook until sugar melts and pumpkin seeds begin to caramelize, about 45 to 60 seconds. Transfer to bowl with spices, and stir well to coat. Let cool. These may be stored in an airtight container for at least a week. It doesn’t get much easier than this. Combine pumpkin pie spice and coffee grounds in coffee filter, brew. Add milk or half & half and sugar to taste (you control the sweetness, unlike at a coffee shop). B. Smith says the secret to great biscuits is to use chilled butter or shortening. We liked these served as an accompaniment to a warm bowl of soup on a chilly fall day. In a food processor fitted with the metal blade, sift together the flour, baking powder, baking soda and salt. Add the butter or shortening and pulse briefly, just until it is the texture of coarse meal. Add the pumpkin and buttermilk to the flour mixture. Pulse just until the dough is soft and easy to handle. Do not overprocess, or biscuits will be tough. Turn the dough onto a lightly floured work surface. Knead the dough gently until smooth. Roll it out to 1/2-inch thickness, sprinkling more flour on the work surface as necessary to prevent sticking, and cut the dough into rounds with a 2-inch biscuit cutter or the top of a 2-inch glass. Scraps can be rerolled and cut into more rounds. Place the biscuits on a lightly greased baking sheet. Bake for 10 to 12 minutes, or until lightly browned. Serve warm or at room temperature. The Rev. Samuel Esposito grew up cooking in his grandmother Jennie’s house in Ellwood City, Lawrence County, and for most of his adult life as a priest he has had to bach it in the kitchen. He knows how to work a bit of heaven into a pound of chicken cutlets or simmering pot of spaghetti sauce. His reputation as one of the Pittsburgh Diocese’s best cooks is such that for several years now, parishioners have auctioned his homemade meals — cooked and served on site — at various fundraisers for as much as $2,500, serving as many as 16 people. Last Saturday, for example, Father Esposito spent the evening whipping up a gourmet dinner that Laura and Michael Rubino of Monaca successfully bid on at last year’s Red Carpet Gala at Quigley Catholic High School in Baden. Featured on the seasonal menu for 11 was a creamy Walnut and Mushroom Risotto, followed by Fruited Pork Tenderloin slow-roasted with dried apricots and raisins, savory Baked Greens and Caesar Salad. For dessert, there was a homemade Crostata filled with apples, figs and cranberries. 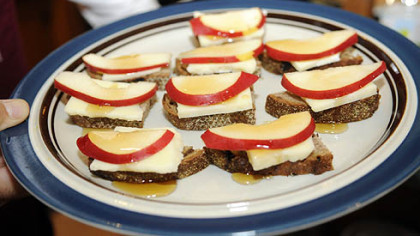 Once plated, it enveloped the tiny kitchen in the heady aroma of baked fall fruit. When members of The Little Sisters of the Poor’s advisory board decided, then, that it might be fun to build its annual fundraiser around some sort of food event, Father Esposito’s name was among those that came up as part of a small fraternity of foodies in the diocese that loved to cook for family and friends. A few years back, the charity’s Cleveland home threw a gala for which local priests did some of the cooking. It proved a smashing success. The Sisters decided to try it here. Talk about being right on the money. Tickets have been flying out the door for “A Heavenly Feast” on Oct. 25, an evening of fine food and wines at The Cardinals’ Great Hall at St. Paul Seminary in East Carnegie. Event chair Mary Lou McLaughlin says, “Everyone is so excited,” and none more so than the seven priests who joined Father Esposito in sharing recipes for the dinner with Common Plea Catering, which will do the bulk of the cooking led by owner John Barsotti. So many priests wanted to take part in the event that the board already has enough cooks lined up for a future fundraiser. “It just sort of took on a life of its own,” says Mrs. McLaughlin with a laugh. Organizers hope to sell 350 tickets by Oct. 11, raising more than $250,000 for the Little Sisters, who this year celebrate their 140th year of service. The group’s Brighton Heights nursing home in March was named one of the country’s best by U.S. News and World Report. The sisters have cared for more than 12,000 elderly poor residents in Pittsburgh since opening their first residence on Eighth Street in 1872. Hosted by WQED’s Michael Bartley, the dinner will include music by the Duquesne Jazz Ensemble and an auction of several high-tickets items, including a private dinner for eight in the Phipps Conservatory garden, trips to Scottsdale, Ariz., and New York City (to see “The Colbert Report”) and a wine tasting for 10 with Father John Sawicki. The Little Sisters also will honor advisory board chair James F. Will for his many years of service with the first-ever Saint Jeanne Jugan Medal, the highest recognition ever bestowed by the group. While finding cooks and recipes was easy, adapting recipes originally meant for a family of six or eight to ones that could feed an army was a bit more challenging. After narrowing their submissions to a final best-sounding dozen — no simple task in itself, as a few of the priests dished up not just one favorite childhood dish but entire menus — each had to be tested by Common Plea master chef John Brush and his staff in its Strip District kitchen. 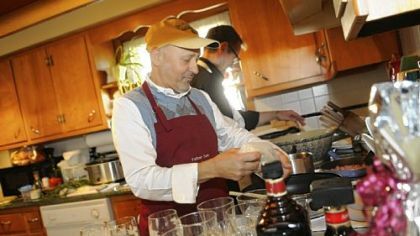 Among the dishes sampled at the tasting lunch in July were Father Joe Sioli’s Baccala in Bianco, or salt cod in white wine sauce, which he learned to cook from his Italian grandmothers, and Father Nicholas Vaskov’s Bigos, a sour and savory hunter’s stew made with sausage that’s the national dish of Poland. It will be served alongside Mizeria, a tangy cold salad of cucumber and red onion. “We had to make sure each recipe tasted like it was supposed to taste, verbatim,” explains Mrs. McLaughlin. Especially since the priests, given the size of the crowd, won’t actually cook their dishes but simply finish them at “celebrity chef” serving stations. Rounding out the menu are seasonal salads, several pasta dishes and Father Esposito’s much-loved Chicken Piccata. Food almost always tastes better when it’s served with drinks made with an equal amount of love, so in addition to a selection of fine commercial wines, guests will get to enjoy two homemade spirits: Riesling from Father Bob Miller of St. Benedict the Abbot in Peters and 8 gallons of limoncello that Father Esposito made two months ago; last week he gave tastes of that to his fellow cooks at a get-to-know-you lunch at the Little Sisters’ North Side home. This being Pittsburgh, the event also will boast a cookie table. Parishioners from St. Richard in Richland have promised to wow the crowd with some 2,000 cookies. Also, Father Larry DiNardo is making his famous Ricotta Cheesecake. Watching as Father Esposito prepared last Saturday’s meal at the Rubinos with his long-time sous chef Mike Matta, it’s obvious that he is in his element in the kitchen. He doesn’t miss a beat as he goes from ladling hot broth into a pan of Arborio rice for risotto to putting the finishing touches on a pan of Swiss chard, diced pancetta and shaved pecorino Romano, which he’ll bake to just the right mix of crispy and melty. His first cooking lessons, he recalls, were taken watching over his grandmother’s shoulder. Nothing was more revered than family meals, and everyone was expected to pitch in in her basement kitchen. “As soon as I got home from school, she gave me something to do,” he says. Sometimes it was helping to make pizza or sauce; other times he was charged with firing up the pizzelle iron to make dozens and dozens of the anise-flavored Italian cookies, which he quickly learned to time to one “Hail Mary” per side: If the cookies were too dark, he was praying too slow. Too light, and he wasn’t praying enough. He continued honing his culinary skills as a student at Indiana University of Pennsylvania, where, armed with a dozen recipes printed on index cards by one of his aunts, he quickly cut a deal with his roommates: You clean, and I’ll cook. He also cooked during seminary at Mount St. Mary’s, and at various rectories after being ordained in 1978. Though he taught a class in the early 1990s for the Leukemia & Lymphoma Society’s Camp Raising Spirits on how to spark the appetites of cancer patients, Father Esposito didn’t go public, so to speak, with his excellent cooking skills until 2001: While pastor of Good Samaritan in Ambridge, he was raffled off for the first time at a charity event for Sisters Place. After that, his reputation as a chef quickly grew. These days, his home-cooked dinners are on the auction block as many as six times a year, and he’s always happy for the opportunity. “We invite people to the altar for a banquet, so why not to our own table?” he asks. This sauce undoubtedly gets better the longer you simmer it. I added a couple pinches of hot red pepper. 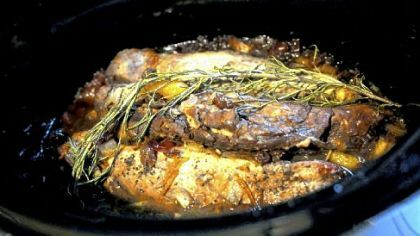 Put olive oil in a large cooking pan or pot over medium-high heat, and when hot, add onion and cook until translucent. Add garlic and cook for a few minutes, until flavor is released. Add zucchini, and continue to cook another 2 minutes. Add meat loaf mix, breaking up the meat. Cook until it is lightly browned, about 3 minutes. Add white wine, and cook until it evaporates, about 2 minutes. Add chopped tomatoes. Simmer for 20 to 30 minutes. While sauce is simmering, cook orecchiette according to package directions. Drain, reserving about 2 tablespoons of the pasta water. Set aside. 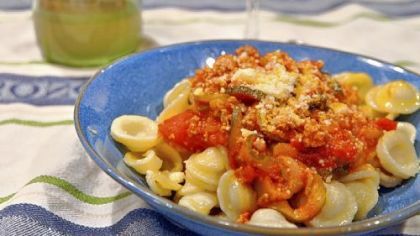 Add drained pasta and reserved pasta water to cooked sauce, and toss to coat. Add Parmigiano-Reggiano, mix well and salt to taste. Just before serving, add a handful or two of raw spinach, if desired. This simple salad is fresh and tangy, and perfect served any time of the year. In a large bowl, mix cucumbers and salt. Cover and refrigerate for 1 hour. Drain water from bowl and add red onion slices. 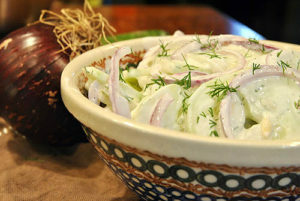 In a small bowl, mix sour cream, cider vinegar, dill and black pepper. Add sour cream mixture to cucumber and red onion slices and mix gently. Cover and refrigerate until ready to serve. Make sure the pancetta or bacon is good and crispy. Bring lightly salted water to a boil in a steamer with a tight fitting lid. Once water is boiling, place chopped chard into steamer basket. Steam with lid on for 3 to 5 minutes. After steaming greens, squeeze excess water from them. Set aside. Parboil or microwave potato slightly. Coat glass baking dish with 1 tablespoon oil. 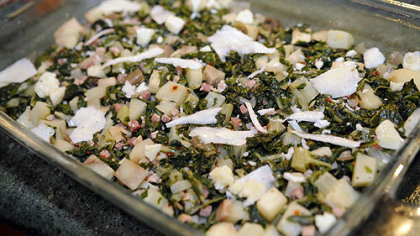 Mix together greens, garlic, salt and pepper, potato and pancetta with remaining 1 tablespoon oil. Place mixture in dish, cover with foil and bake at 350 degrees for 30 minutes. Remove foil, add cheese and continue baking an additional 15 minutes.